Erdgeschoss, Blick auf den Golf, kostenlose tägliche Strandkorbeinrichtung; Jetzt für 2019 buchen! Maravilla liegt im gehobenen Ferienort South Walton / Destin am Strand von Miramar, etwa 5 Minuten westlich von SanDestin und 5 Minuten östlich der Stadt Destin. Dieses wunderschöne Resort ist ein sehr beliebtes Urlaubsziel für Familien mit eigenem Privatstrand für Besitzer und Gäste. 3105 Maravilla ist eine fanatisch gepflegte und verbesserte 2BR 2BA Gulfview Wohnung - ja, Sie können das Wasser von Ihrer Terrasse im Erdgeschoss sehen, die auch eine große Rasenfläche überblickt, die sich hervorragend für Kinder eignet. Die Lage im Erdgeschoss ist ideal für Familien mit Kindern, Senioren oder alle, die keine Treppen steigen oder warten, warten, auf den Aufzug warten. PRIVATES STRANDGATE IST SCHRITTE VON IHREM PATIOTOR MIT TÄGLICHEM EINSATZ VON 2 STRANDKETTEN UND REGENSCHIRM 15. März - 31. Oktober. -King Bett in Master hat neue Matratze 10/18 installiert; MBR hat auch einen 32-Zoll-Flachbild-LED-Fernseher. -COX Digitalen HDTV, 47-Zoll-1080p-LCD-Flachbild in den w / Blu-Ray-Player und Yamaha Verstärker w / Dolby-Surround-Sound. Empfänger hat IPod / MP3-Anschluss. - KOSTENLOSES Highspeed-WLAN - überprüfen Sie Ihre E-Mails auf der Terrasse. -3105 Ist auch durch seine gehobene Küche mit Silestone aus, GE Edelstahl smoothtop Bereich, GE over-the-Bereich rostfreier Spacemaker 1. 8 cu. ft. Mikrowelle, GE Edelstahl Kühlschrank mit Eismaschine, und GE rostfreiem Geschirrspüler. Mieter müssen MINDESTENS AGE 25 pro HOA Satzung KEINE STUDENTEN, keine Haustiere, nicht geraucht werden darf. Great property, clean, modern, and well maintained! 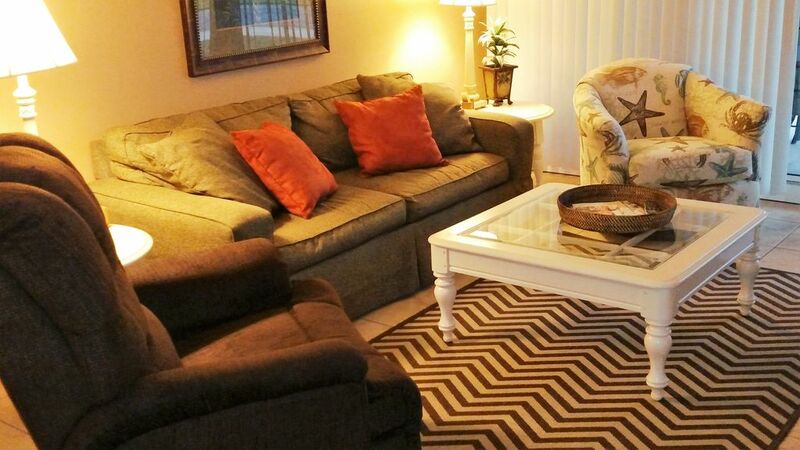 Overall great place to stay, easy first floor access, I highly recommend this property! My friend and I stayed here for 7 nights the end of April. The property was amazing . The Condo was very clean and comfortable .We loved sitting on the patio which had great view and friendly neighbors.. The beach, the beach chairs, and all local restaurant's were wonderful. Thanks for the hospitality I'm missing the beach already until next time..
Our stay was great! I have been to this area 5 times, and this was the first time I truly felt at home. The property is very up to date and nicely decorated. Having the patio on the first floor was just perfect for our needs. Easy walk across the street to the beach. We had a wounderful time. This is the second time we stayed at the Maravilla and love the location. As for our 3 year old son it was his first time to the beach, he loved it and didn't want to leave. It is located right accross the street from the beach and is a very short easy 2 min walk to get there. It is also a short walk to two wounderful restaurants, Captain Dave's and Pompano Joe's. (I recommend you try both.) Everything was exactly how it is pictured. The condo was very clean and neat. Andy was great to work with he was very quick to respond to any questions I had. I recommened this condo to anyone wanting to visit Destin. I have to add that the beach service is a big plus. It was so nice to walk down to the beach and already have your chairs there. Top notch condo, well done Andy and Linda. Thanks for letting us enjoy your let piece of paradise. We had a great time at Maravilla. The condo was exactly as pictured and it suited our needs perfectly. The heated pool and jacuzzi were definitely an added bonus as the regular pool was too chilly this time of year. We also met so many nice families. We hope to stay here again. Loved the ground floor. No noise from other condos. Very close to everything Destin has to offer. Short walk to the beach. It was just a wonderful time. We have rented from the owners for several years. They respond quickly to questions,and maintain a beautiful spotless full functioning condo. The photos accurately show the condo, the first floor entrance is wonderful,and the beach is easy to access. The complex is safe, quiet and located in a wonderful area of Destin. A variety of activities are available for all ages to participate in, including parasailing, scooter rentals, outlet shopping and a multitude of restaurants. We look forward to our return! NOTE: WE OFFER A 5% DISCOUNT TO GUESTS WHO PAY BY PERSONAL CHECK INSTEAD OF CREDIT CARD; CALL FOR DETAILS.